Luxury Italian playing card set is hand-made of the most precious and superior woods and others have no comparison, the woods used are Briar, Mahogany & Burl. In recent years, faux woods have appeared in the marketplace. None of these fake reproductions, however, often sold as real they cannot begin to replace the beauty or the feel of the natural woods themselves. Design, function, quality and beauty are the features that make this luxury playing card case very unique. This box truly exemplifies luxury at its very best, and is definitely a set to impress, this is a fine piece of furniture to leave on display on your coffee table, game table or dresser. This is an unforgettable gift that will be appreciated from one generation to the next. Size: 6 3/4" x 4 3/4" . Luxury Italian playing card set is hand-made of the most precious and superior woods and others have no comparison, the woods used are Briar, Mahogany & Burl. In recent years, faux woods have appeared in the marketplace. None of these fake reproductions, however, often sold as real they cannot begin to replace the beauty or the feel of the natural woods themselves. 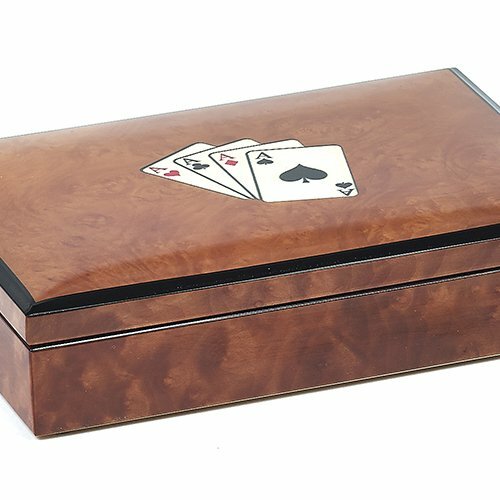 Design, function, quality and beauty are the features that make this luxury playing card case very unique. This box truly exemplifies luxury at its very best, and is definitely a set to impress, this is a fine piece of furniture to leave on display on your coffee table, game table or dresser. This is an unforgettable gift that will be appreciated from one generation to the next. Manufacturer: Bello Games New York, Inc. Publisher: Bello Games New York, Inc. Studio: Bello Games New York, Inc. If you have any questions about this product by Bello Games New York, Inc., contact us by completing and submitting the form below. If you are looking for a specif part number, please include it with your message. Kubbspel Classic Kubb Official U.S. Tournament Size Blue King (Made in Italy) Lawn Game 19.8 lbs. Kubb Game Kubbspel Classic Official U.S. Tournament Premium Dark Stain Finish (Made in Italy) 19.8 lbs.